The Yarn Harlot recently posted about her daughter Sam going away for a while, where it was cold and so she, The Harlot, is knitting lots of warm woolies to wrap her loved one. Our youngest, Macy, has joined the Peace Corps and has been posted to Paraquay. Unfortunately with a climate very similar to Florida she won’t be needing any knits from mom, but that doesn’t mean I won’t knit to get ME through her service. It is a 27 month commitment, so she won’t be home until Dec. 2012. And yes, that is a very long time to be away from her family. Here she is with everything she will need for the next 2 years!!! 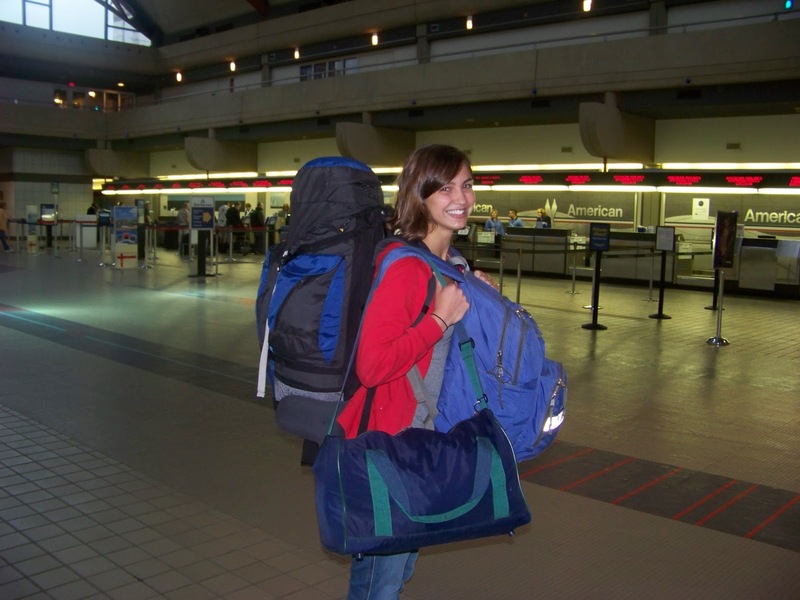 Now this girl knows how to pack light. She is in training in Paraquay and chomping at the bit to get posted to her final location which will happen in early December. The Peace Corps keeps them in training for three months, covering things like safety and security, working with the local culture and how to take a bucket bath, all important information. She is staying with a family outside of Ascencion, the capital city. They are very good to her and she promises me her “mom” worries that she eat enough, just like I do. Yes, mom’s are universal in their belief that the amount you are loved is directly proportional to the amount of food prepared for you. To help me cope with her being out of phone range, I have been knitting up a storm. The two pieces featured above are mittens for a class I am teaching at Knit One in Pittsburgh. 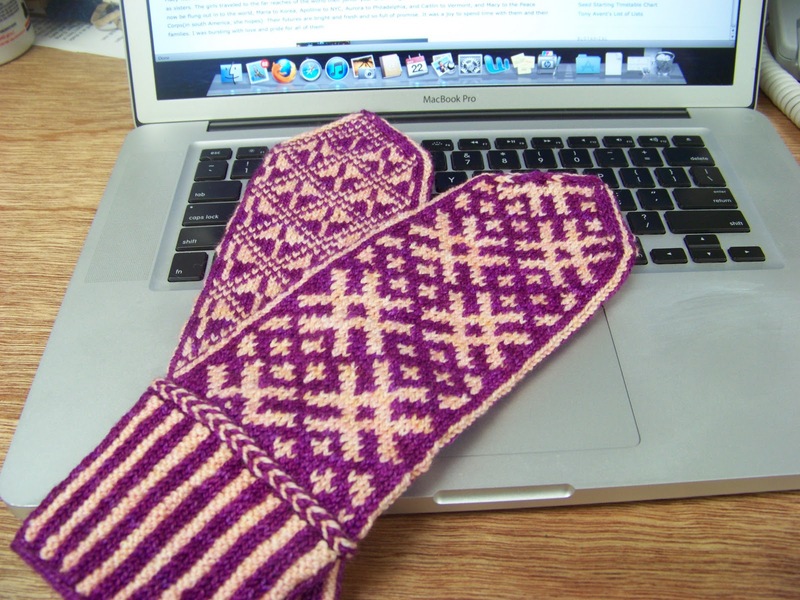 “Latvian Mittens”. The pink is Malabrigo Magenta and peach is something from my stash. The blue and coppery colors are Madelin Tosh Sock in color Afternoon and Malabrigo Sock in Primavera. Both were knit in the round on #1 and 2 DPNS. They both include Latvian braids. There are no thumbs because we are going to cut open the thumbs during class. I think it is a perfect use for those of us with too much sock yarn in our stashes. They are warm and silky and feel great on your hands. I’m also planning a pair of gloves to make out of Malbrigo Tiziano Red and some old kettle died sock yarn I found on my stash. These will be based on Selbuvotter designs and techniques. I’ll keep you posted on the Peace Corps volunteer and the knitting I complete while she is saving the world. I can relate to you and the Harlot. You must be immensely proud that your daughter has joined a great cause. I have never heard anyone regret going into the Peace Corps., but I imagine moms across the country sharing similar anxieties. Glad to hear she likes the home she is staying in and please do keep us posted. 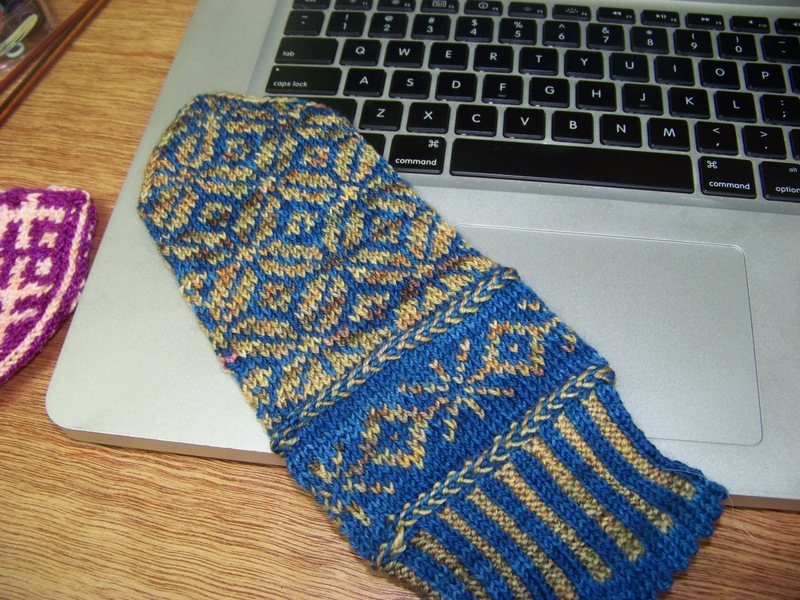 Beautiful mittens…what fun Knit one in Pittsburgh looks like. I'd love to go some year. Two years is a long time for your girl to be away, but maybe you can visit Paraguay? I think it sounds like fun. Don't they make some special kind of lace there?